The Buckeye Bullet is a collaboration between Ohio State University and Venturi, and although due to the flooding of Bonneville salt flats (Utah, USA), the FIA and the organizers of the world speed records program decided to cancel the competition for this year, the team were targeting a 400 MPH (640 km/h) world land speed record for electric cars. The car, called VBB-3, is actually the third “Buckeye Bullet” land speed record car. Driver Roger Schroer took the VBB-2.5 to 307.58 mph in 2010, giving him the current FIA world record. 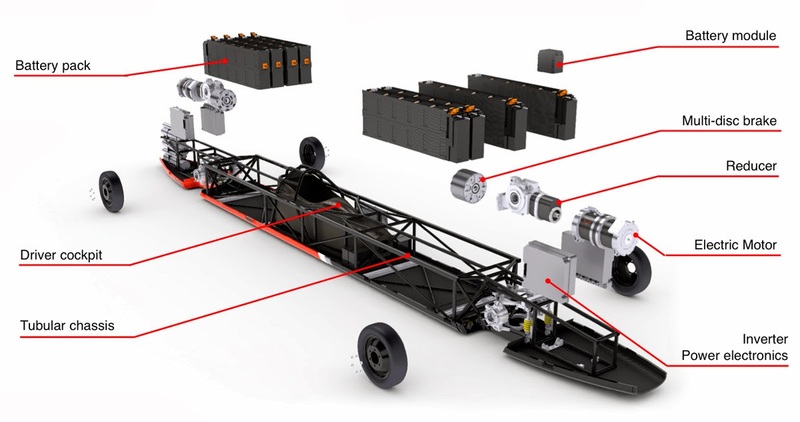 VBB-3 is powered by four electric motors, which generate 400 horsepower each (750 hp Peak) with energy storage provided by 2,000x prismatic A123 batteries that weigh 1,600 kg. The 3.2 ton Carbon fiber skinned vehicle can output a total of more than 2 Megawatts (3,000 hp) which, when combined with a drag coefficient of only 0.13, the team hope is sufficient to re-write the EV Land Speed Record. To break the record, the electric car must travel at least one mile and average two runs within an hour. The student team hopes that the new car will break 400 mph, something no electric car has achieved, but this will now have to wait till 2014.